Members of the Joint Council of Action South Zone which represents employees from the Railway, Defence, Postal and other Central Government departments organised a protest meeting near the Collectorate premises here on Monday. 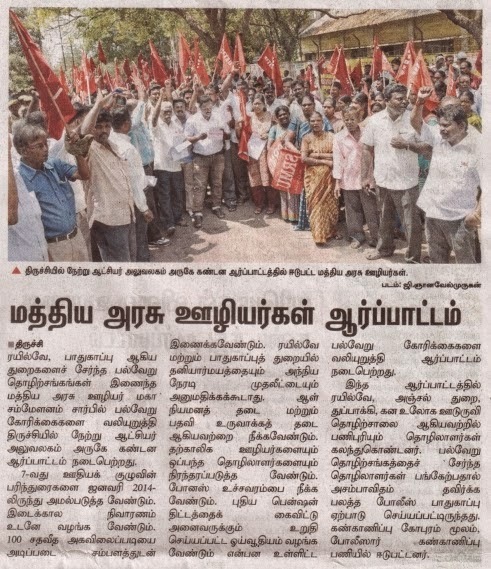 More than 300 members of various associations, including Southern Railway Mazdoor Union (SRMU), All India Defence Employees’ Federation (AIDEF) and National Federation of Postal Employees (NFPE), participated in the protest meeting. Zonal president Raja Sridhar and divisional secretary J.M. Rafiq addressed the meeting. The members also submitted a petition at the Collectorate along with a copy of the demands adopted by the National Convention of the Central Government Employees in December 2014. 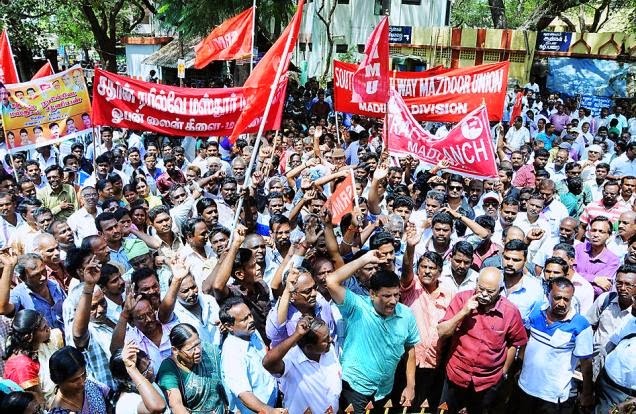 In their 37-point charter of demands, the employees asked for the implementation of wage revision for Central government employees, which should be done once in every five years. They also demanded that no privatisation or Foreign Direct Investment should be allowed in railways and defence establishments, and opposed corporatisation of postal services. Among other things, they also opposed outsourcing and privatisation of governmental functions and asked the government to withdraw the proposed move to close down printing presses. Stating that many residential quarters needed renovation, the employees urged the Central government to carry out repairs, not to compel staff to stay in inhabitable quarters, and pay house rent allowance. Employees of Central government organisations staging a protest near the Collectorate in the city on Monday.